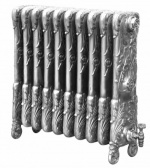 Dating from circa 1900, The Chelsea Cast iron Radiators are elaborately decorated and were originally commissioned for the Chelsea Barracks Officers' Mess. This radiator looks outstanding in polished or highlighted finish. The Chelsea comes in a variety of finishes, we have an extensive range of colours and finishes to choose from. Hand burnished finishes are a popular look but it does require a small amount of maintain ace and is not citable in bathrooms. Which ever look you go for the Chelsea makes a real statement. Our cast iron radiators are all hand assembled in the UK and have been supplied to celebrity clients and stunning properties both in the UK and abroad.